Vidya Herbs is on an expansion spree and has set a Rs 1,000 crore target over the next five years. A few years ago, Vidya Herbs was an exhibitor at a European Expo when a visitor approached representatives of the Bangalore-based company and expressed interest in buying it. K Shyam Prasad, the company's Founder and Managing Director, wasn't interested at all. Having built the company, which has the same name as his 14-year-old daughter, from scratch, Prasad, now 47, wanted to see it grow bigger. Prasad worked with a Bangalore-based pharma company until 1995, when he decided to venture into a business that dealt with natural products. "I had studied Natural Products Chemistry in my Masters and wanted to apply the knowledge to business." After quitting his job, Prasad started trading in herbal extracts. In 1999, he began exporting herbal extracts to countries such as Japan and the US. During one of the deals, Prasad was taken by surprise when a German customer paid him a $10,000 advance. "He didn't even see the product. I then realised the potential of herbal products in the export market. Some of my buyers also wanted me to set up manufacturing." The trading business brought Prasad revenues of Rs 4 crore. It was in 2001 that Prasad eventually ventured into manufacturing by setting up Vidya Herbs. "We started with a 10,000 sq. ft. manufacturing facility on the outskirts of Bangalore. Growth came gradually. We acquired more land around the plant and expanded." The company has three manufacturing units in the city, and clocks in revenues of Rs 169 crore from manufacturing of herbal extracts and another Rs 130 crore from overseas trading of herbal products. Vidya Herbs procures and processes 2,000 tonnes of turmeric, 1,000 tonnes of coffee, and large quantities of ginger and black pepper from farmers and aggregators every year. "We take the farmers to our factories to sensitise them with the problems that we face due to adulteration in the raw materials. We ask them to charge a premium, but provide us quality produce," says Prasad. The company has a well-equipped team to test samples. It also gets its samples tested from independent labs before shipping the products. "We want to make sure that the customer is safe. There is strict quality control in our process and finished goods. We need to keep working on enhancing our offerings," says Prasad. The company wants to expand its R&D facility, and is also setting up a 40,000 sq. ft. research centre in Bangalore. As far as acquisitions go, Vidya Herbs has made two so far this year - Cochin-based Manko Natural Flavours and Extracts, and Dynadis Biotech in Pondicherry. "We spent Rs 5 crore on the Pondicherry acquisition in June and we have already got an order of a million dollars from Europe. The unit was doing annual business of Rs 70 lakh. We are [now] looking to invest in higher value addition," says Prasad, adding that the Pondicherry plant alone will add Rs 200 crore to the business. Today, the US is the company's biggest market, followed by Japan. Revenue from the US is about Rs 100 crore, while Japan brings in another Rs 50 crore. "None of our shipments get stuck in the US. They have a smooth sail. Our plant has been audited by the USFDA," says Prasad. In Japan, the buyers used to once sift Vidya's products before buying because of previous bad experiences with Indian suppliers. "Things have changed. I am trying to create a good image of Indian manufacturers in Japan," says Prasad. Vidya Herbs is also trying to expand its presence in Europe, a relatively new market for it. The company has now set a target of Rs 1,000 crore from domestic and overseas markets combined over the next five years. While the focus on overseas market remains strong, the company has started realising that the domestic market is way too big to be ignored. It is now planning to venture into the domestic health food supplement market. "We are launching a mango extract product that has health benefits for [people with] diabetes and [helps in] cholesterol management. More products are in the pipeline under a new brand Slimferin," says Prasad. Vidya Herbs boasts global customers such as health-care major Abbott, Kraft Foods, spice maker McCormick and nutrition company Herbalife. "Business is all about relationships. We have long-standing customers because we operate in a transparent manner," says Prasad. 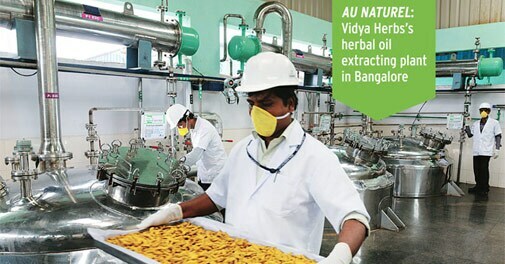 VDF FutureCeuticals, a US nutraceutical and functional food manufacturer with sales of $200 million, has been doing business with Vidya Herbs since 2007. Says Boris Nemzer, Director of R&D and Quality Assurance at VDF FutureCeuticals: "Vidya Herbs has the ability to develop new products for us in quick time based on our requirements. We do not use and look to other sources of similar materials from other Indian manufacturers. Vidya products are of high quality." Prasad clearly knows what he is doing. "I know the business on my fingertips. We will be a well-known company. There is enough scope to scale up as long as we continue offering quality products."